Colorado Governor, Jared Polis, and President of the Colorado Senate, Leroy Garcia, will deliver the spring Colorado State University-Pueblo commencement addresses in the ceremonies taking place on Saturday, May 4 at the Massari Arena on the CSU-Pueblo campus. Senator Garcia will deliver the commencement address at the 10 a.m. commencement exercises for students being graduated from the College of Education, Engineering, and Professional Studies (CEEPS) and the College of Science and Mathematics (CSM). 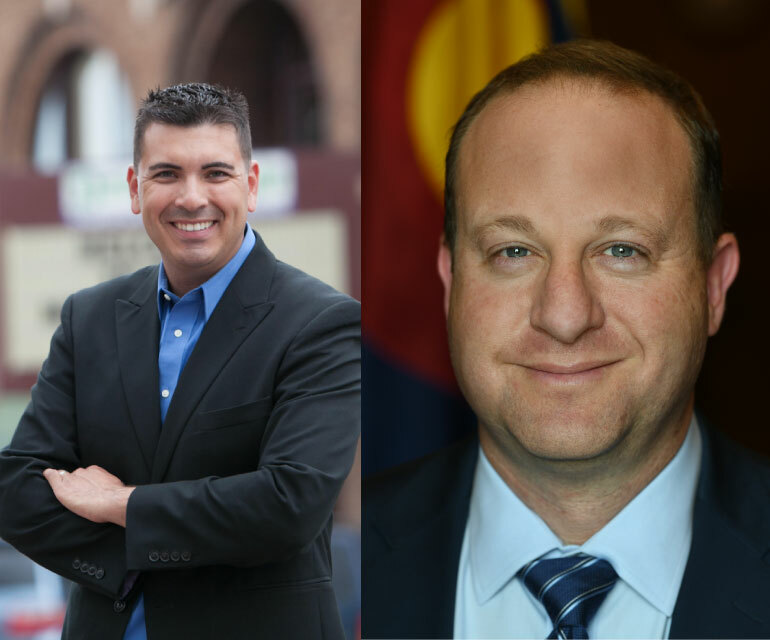 Both Governor Polis and Senator Garcia will deliver the commencement address at the 3 p.m. commencement exercises for students being graduated from the College of Humanities and Social Sciences (CHASS) and the Hasan School of Business (HSB). This is the first time commencement exercises will be held on the CSU-Pueblo campus in more than 25 years. Polis is an entrepreneur, education leader, public servant, and Colorado native. He started his first business, American Information Systems, while in college out of his dorm room. By the time he was 30, he launched three successful companies, including ProFlowers, one of the world’s leading online flower retailers. Polis’ pioneering role in the internet economy earned him an “Entrepreneur of the Year” distinction from Ernst and Young. He co-founded Techstars, a startup accelerator that mentors entrepreneurs from all walks of life, and Patriot Boot Camp, which helps veterans start their own small businesses after coming home from their service. Most recently, Jared served as the U.S. Representative for Colorado’s Second Congressional District, which stretches from Larimer County and the Wyoming border, to the Central Mountains at the heart of Colorado’s tourism economy, to Boulder and the U.S. 36 high-tech corridor. During his time in Congress, the Center for Effective Lawmaking ranked Jared the most effective member of Colorado’s House delegation due to his success working across the aisle to improve Colorado’s schools, protect public lands, and support startups and small businesses. Garcia was elected in 2014 to represent Senate District 3, which covers the Cities of Pueblo, Pueblo West, and part of the community in Salt Creek. In 2018, Senator Garcia was unanimously elected by his colleagues to serve as President of the Senate, previously serving as Assistant Minority Leader and Senate Minority Leader. Prior to being elected as President of the Senate, Senator Garcia served on the Senate Agriculture, Natural Resources and Energy Committee, and the Appropriations Committee. During his time in the Colorado State Senate, Senator Garcia has sponsored legislation to help improve the lives of southern Coloradoans and people across the state. He passed legislation to create a pilot program for Pueblo and rural Colorado to address the opioid epidemic. He supported fellow veterans through education and housing programs. He pushed to increase accountability and transparency of the utility provider in his district to help the burden of the disproportionate utility prices in Southern Colorado. He also has secured funding for and defended one of Pueblo’s great cornerstones, the Colorado State Fair in Pueblo, and continued to protect Southern Colorado’s water. Garcia also has pushed to explore transportation solutions like a potential rail line along the I-25 corridor through his work with protecting the Southwest Chief and securing funding to make improvements on Highway 50. He has helped paved the way for a new building for the regional office of the Colorado Bureau of Investigation in Pueblo West, and new offices for the Colorado State Patrol and the Colorado Department of Transportation that opened in spring of 2018. From 2001 to 2007, Senator Garcia served in the Marine Corps. Deployed to Iraq as a mortuary affairs specialist, he personally understands the risks faced by the members of our armed forces and is committed to providing for our veterans. He is a member of the Pueblo Veterans Council, VFW Post 15006, American Legion Post 2 and the League of Marines Home of Heroes Detachment. Senator Garcia also teaches emergency medical services at Pueblo Community College and is a paramedic with American Medical Response in Pueblo. Senator Garcia grew up around the Pueblo beauty salon his parents have owned and operated for more than three decades, giving him an appreciation for the power of small business in securing the American Dream. He is a first-generation college graduate, with a master’s degree in organizational management from Ashford University in Clinton, Iowa; a bachelor’s in management from the University of Phoenix and an associate’s degree in emergency medical services from Pueblo Community College.